With a ten-hour charge time the Solar-fine 1350 might not be much use in the UK. The new ¥7,980 (£33.50) charger tries to make itself more attractive than the competition by including adapters for juicing up the most common products. Dongles are included for a range of devices, including almost all Japanese mobile phones, various handheld games machines, including the PSP and DS, and - of course - most members of the iPod family. With a capacity of 1350 mAh (you guessed that one, right?) 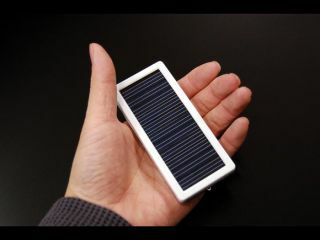 and a voltage of 3.7V, the Solar-fine is obviously up to the job, but a solar-charging time of ten hours might explain why Links has sensibly included the option to charge by AC or USB too.